Home /DIY / How do Audio Cassettes Work? How do Audio Cassettes Work? If you were into memes around 2010, you’ll know that a recurring one was, “How do magnets work?” I don’t want to get too deep into memeology, but here’s a sample. The gist of it is that a really dumb rap group wrote a song about how magnets were little miracles and they weren’t sure how they worked. This little trip down meme-ory lane might seem like a complete detour, and it kind of is. But magnets are actually a major part of how cassettes work. I like to imagine the absolute mind-melting knowledge that this rap group would experience if they knew that not only do we know how magnets work, but we actually use that knowledge to make the very audio cassette tapes that people used to listen to their “music.” Take that, ICP. That’s the real reason you’re here. Unfortunately, to answer the question, we’ve got to lay down a couple of building blocks to describe exactly what happens when you play a cassette. To start, we have to think about the way that sound functions. Basically, all sound travels in waves, and when visualized, it looks kind of like this. If we look at vinyl records, we can see that they look like this when magnified. What we’re looking at is essentially sound waves that are etched directly into the plastic, and when we move a needle over them, we get sound played back. Here’s a really nice video that explains it in greater detail. If you watched that really helpful video, you’ll have learned that the sound on records is made by a needle moving over etched sound information, turned into electromagnetic currents, then sent to speakers so that you can pump the jams. Cassettes do the exact same thing, but they use magnetic tape instead of plastic etching to work. 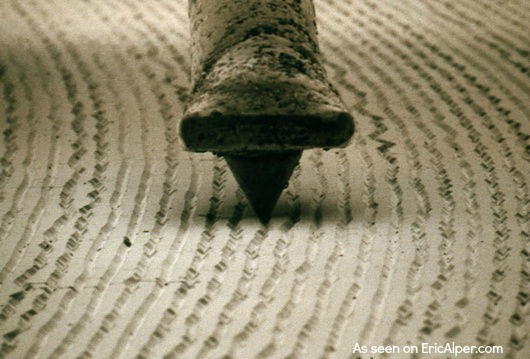 If you stretched out the lines etched on a vinyl record and laid them straight out in a line, that’s basically what tape is. As you know, there’s no etching on cassette tape. Instead, the sound waves are “etched” magnetically onto the tape. When you play a cassette, the tape is run past a head that moves up and down from the charge on the tape. Just like a needle running over the etched sound waves on a vinyl record, the electromagnetic head of a cassette moves from the sound waves recorded on the tape. The movement of the receptor is translated into electromagnetic waves which are then sent to your speakers. When you break it down, tapes and vinyl records basically use a similar playback technology, just done through a different medium. Tapes use a magnetically charged strip of cellophane run past an electromagnetic head for playback, while vinyl tapes literally scratch a needle over etchings in plastic. Tomato, tomahto.